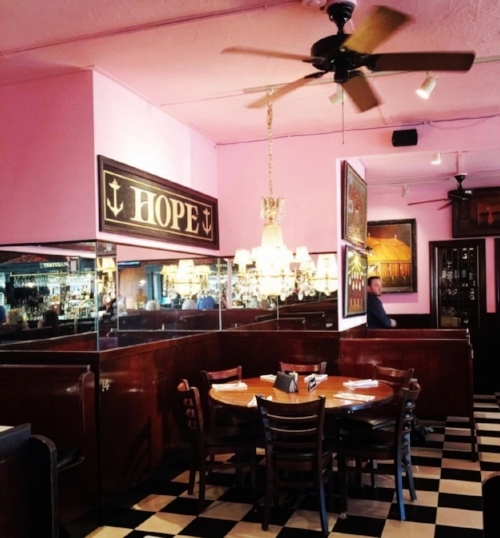 Long before it was featured in Vanity Fair, in 2016 for its 100 anniversary, the Olympia Tea Room was the place for eats and drinks in Watch Hill. With its art deco interior (the pink walls and ceiling and that black and white retro tile floor) and paintings by the owner's wife lining the walls, it feels almost like stepping into an old Hollywood movie, as though Bogie and Bacall (with maybe Peter Lorrie or Sinatra in tow...Bogie was after all the head of the original Rat Pack.) are going to glide thru the screen door any second and slide into a booth. Now, post VF piece (A few summers ago while staying in WH, we could've sworn we spotted Graydon Carter, longtime-now-retired editor of Vanity Fair, in town. Hmmmmmmm) and TS, the town and the Tea Room are busier than ever. Exactly why off season (right now and in September) is my new favorite time to be there. So, what the heck are you waiting for? Before the throngs of ppl start flocking come June, July, and August, motor over now for a fantastic, early season din din.